View of Waiheke from the ferry’s top deck. 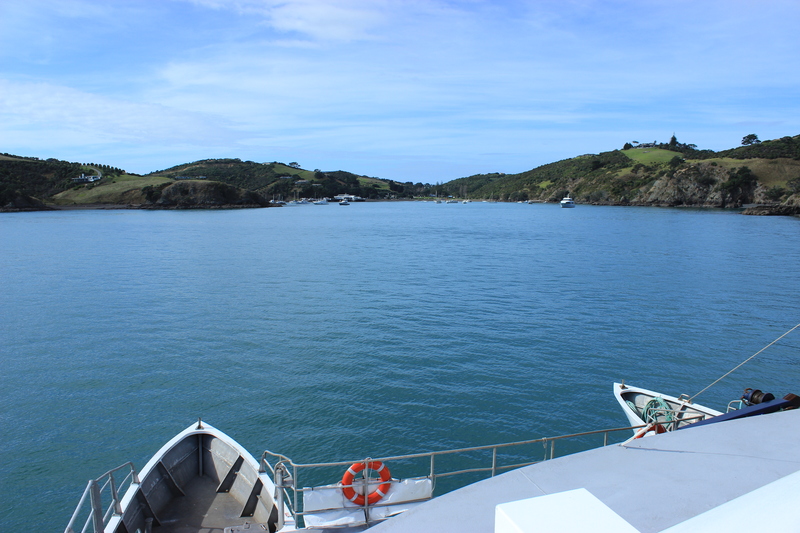 ON SUNDAY, QUITE MIRACULOUSLY, WE MANAGED TO GET OUR ACT TOGETHER AND BOARD THE FERRY TO WAIHEKE BY NOON. Little wisps of cloud passed overhead, but there wasn’t a trace of rain – only the occasional salt spray to freshen our faces. After over a year living in Auckland, we had never paid the $36 fare to get to the island, only a half-hour trip off the city’s coast. As is commonly the case, Colin and I were always planning to go when we had more time to spend there. Finally, some customers of the French Cafe (mainly a Canadian woman who told me it was her favorite place in NZ) convinced me it was time to bite the bullet. Well that’s some sort of understatement. The itinerary for the day was as follows: visit two wineries, walk the beach at Cable Bay, and have dinner at the acclaimed Oyster Inn. 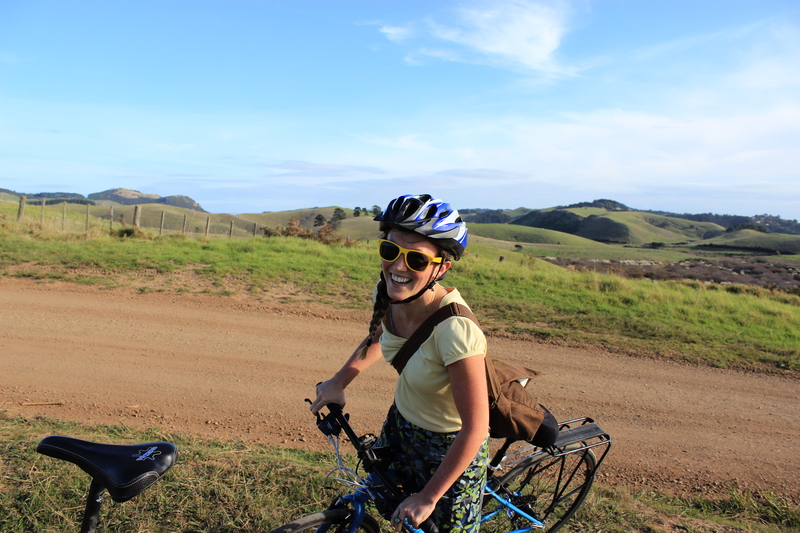 I was wearing an appropriately sunny outfit, one that I thought perfect for casual cycling and wine tasting. I’m quite sure that the serious bikers who passed us later thought me a pretty little fool. I would’ve given a lot for some cycling shorts, at the very least. It’s some small consolation that I look cute in our photos. Before we set off, Colin asked me where I had a mind to go. I told him Man O’ War Vineyards, because we carry some of their wines at The French Cafe and my colleagues had recommended the winery. We looked at the tiny and ill-defined map we picked up at the info booth. I must’ve looked a bit crestfallen. 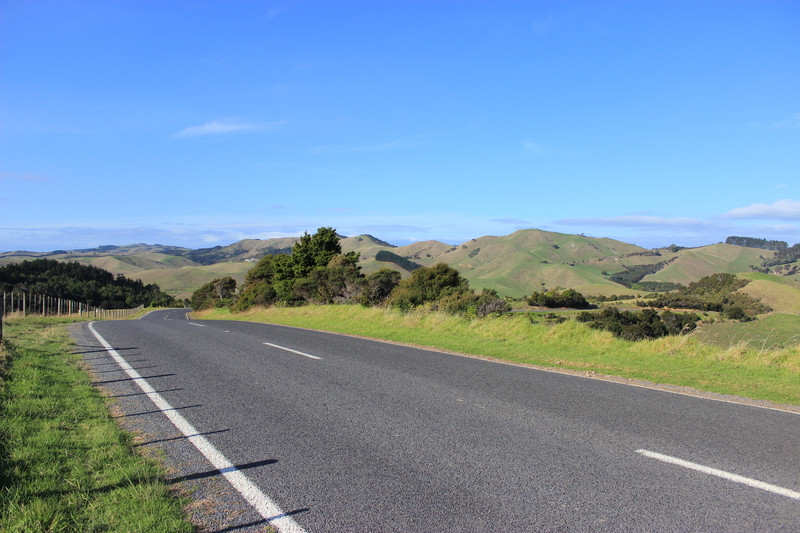 “Why don’t you pick out a couple of closer wineries for us to cycle to,” he suggested. Well, it wasn’t at the top of the hill (which, for the record, was quite large). It was at the bottom of the hill, but on the other side. We climbed and climbed, discussing the phrase “it builds character,” which I associate with my stepdad (who uses this as his motto, particularly on long bike rides in adverse weather) but Colin was adamant it originated with Calvin and Hobbes. When we finally reached Obsidian’s vineyard and cooled off a bit, a lovely little woman guided us through our tasting. 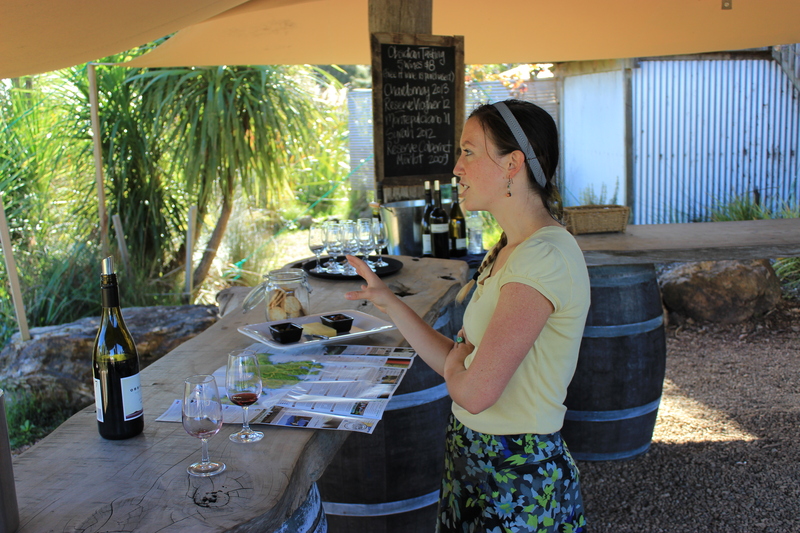 She was absolutely full of knowledge about the different varietals, the grape-growing trends on Waiheke and what we should be paying attention to in the body and character of the wine. Chatting with her was a delight, even if she didn’t really know how to operate the cash register and forgot to give us a discount on the wine, which we only realized after peddling to the top of another smaller hill, and had to turn around. I can only attribute my willingness to purchase a case of wine and have it delivered to our apartment to my feeling of euphoria on such a glorious autumn day; and I can tell you now (after drinking a couple glasses of Weeping Sands Montepulciano with my lasagna last night), I have no regrets. Me, acting as though I know some stuff about wine. We hemmed and hawed. What do you want to do? I don’t know, what do you want to do? Colin nodded in agreement. We pretty much immediately set to climbing another monstrous hill. The air was crisp, and even with all the exertion of climbing we barely broke a sweat. It was perfect cycling weather. The views from the top of our small mountain were incredible, and several times we stopped to catch our breath and snap a few photographs. A view worth climbing small mountains for. We reached the crest of the hill and started a beautifully long decent. At the bottom we turned left onto an unpaved road. At first, it was pretty easy going, with only slight swells, dips and rises. The landscape rolled out before us in too many different shades of green to count. 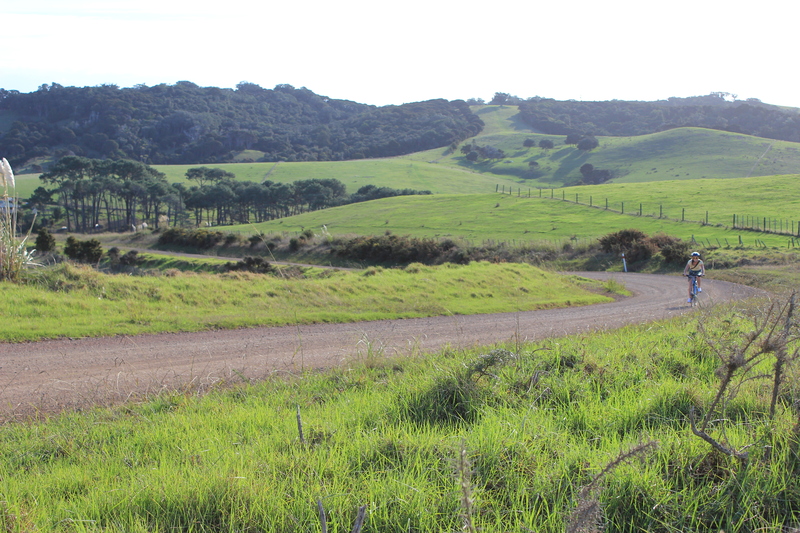 Colin stopped once to ask me if I thought we should press on, as the dirt road went on for awhile. It was my opinion at the time that we’d come too far. No point in turning back. Right around the time Colin was about to say, “it hasn’t been too bad so far,” a massive rocky hill came into view. Turns out he’s really good at invoking character building experiences. For those who don’t know, the thing about using a road bike on dirt and gravel is that, having climbed a small mountain, you can’t exactly coast down it at whatever speed you like. The tires aren’t made for it; they aren’t fat enough to roll over rocks and not send you skidding or flying over the handlebars. Unfortunately that takes some of the fun out of the whole endeavor, because there’s no real reward for hunkering down for a big climb (aside from the view, which does offer some consolation). 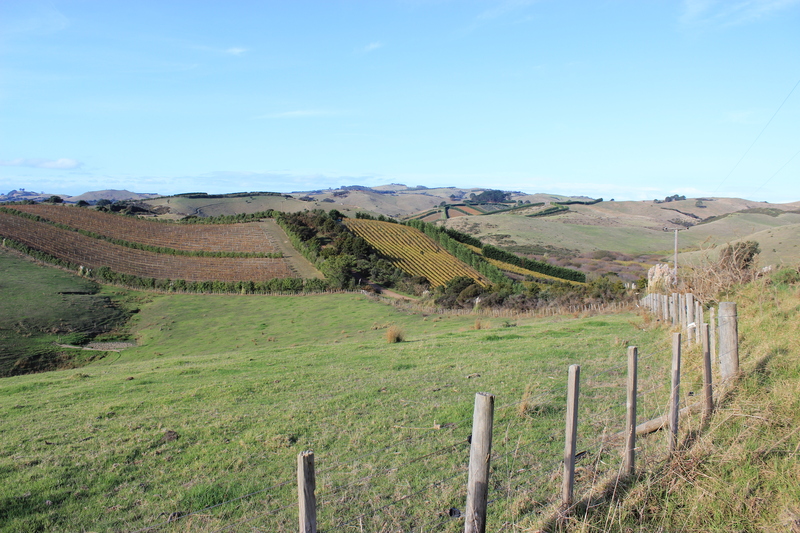 Man O’ War’s vineyards set against the rolling hills of Waiheke. Endlessly thankful that Colin grabbed that repair kit at the last moment. Also thankful that he was willing to get dirty while I looked appropriately concerned, handed him adhesive and applauded his efforts. We got back in the saddle and coasted down into a thick, jungly mess of trees. I vacillated between, my god it’s beautiful here and am I going to have to climb this hill on the way out? We parked our bikes and stiffly walked into the tasting room, where it was obvious they were packing down for the day. I asked if we could still get a tasting, and the woman behind the counter paused before suggesting there was just enough time to try a few wines and have a glass on the front porch. As she poured us a couple different syrahs to try, we regaled her with our journey to the vineyard. When we asked whether it was advised to continue the loop around, she didn’t hesitate to say no. It was longer by five kilometers, she said, and there were also two substantial climbs. Colin and I each got a glass of red (the mildly blended Warspite for me, the bolder Dreadnaught for him) and headed out to the porch to admire the view in what little time we had before it was necessary to begin the return journey. From the winery’s front porch we watched a family tossing a ball around on the well-kept lawn, the sun-setting in the harbor behind them, and a middle-aged couple getting drunk and fondling each other on a picnic bench beneath some trees. At one point, a mouse appeared on the deck, and it was immediately obvious something was wrong with it from the way it hobbled about. When we called this to the attention of a passing employee, she cast it a pitying glance and said, “It’s probably had some poison,” before walking away. Somewhat paradoxically, we watched the mouse struggle for life as the day ended. To make the situation even more absurd, the mother of the family playing in the yard saw the mouse and called her children over to look at it (perhaps this is what happens when you live in a country with no native critters – families ogle mice). We immediately tried to stop her, telling her the mouse was dying, but she persisted. She had two little boys, and the slow moving mouse peaked their interest. As the older boy followed the sick mouse around, I felt a little like I was witnessing a scene from a Steinbeck novel. The sun was going down fast. As if taunting us for lingering at the winery, it dipped down near the horizon, leaving vague pink and orange traces in the gathering clouds. The clouds were definitely gathering, by the way, in a somewhat ominous fashion, and a steady wind was kicking up. Neither of us believed the storm would break while we were cycling back, but it did look like something was a’brewing. I think the red wine made me bolder. We pretended to be pro French cyclists, fueled only by a big glass of vino. I came down a hill a little too fast, skidded and recovered without a fuss. Colin gave me tips for taking fast turns. We peddled on and suddenly we were back on paved road, climbing toward the twinkling lights of the village. As we rolled down the hills into town, we were transformed from Tour de France competitors into flying squirrels. The bicycle has a funny way of disappearing beneath you in the blackness of night. With the wind at your back, it’s easy to forget how utterly exhausted you are and get lost in flight. The magic was broken when I climbed off the bike under the harsh lamplights of town and realized how stiff and sweaty I felt. Well past hunger, we made our way up the boardwalk to the Oyster Inn. Huffing and puffing up another hill, all for the sake of a glass of wine. Dimly lit and warm, with sea-faring paraphernalia on the walls, the interior of the inn looked exactly as we expected it would. It was somewhat surreal to come in from the cold on an island off the coast of New Zealand – somewhere in the Pacific – and be greeted by an American woman from Colorado. The world is always smaller than you think. I sipped deeply on one of the most satisfying ales of my life ( a dark local brew, chosen after a young and clueless barmaid mucked up my martini) and dug into a substantial portion of fish and chips (with line-caught Tarakihi, we were assured). I finished my whole portion, leaned back and ordered another Onetangi Dark Ale (our ferry wasn’t until 9:30…or so we thought…). Though already quite full, I had a mind for dessert. I chose the house special, a toffee and ginger pudding with caramelized banana and vanilla ice cream. Somehow our eyes were still bigger than our stomachs, and Colin also ordered dessert (his one was the chocolate sundae – which we gave an average rating when compared with my spectacular pudding). Let me just say, I don’t think I’ve been that full since Thanksgiving 2012. And so we took an obligatory moment of rest and silence at the fullness of our day in every sense of the word. I think I also gave silent thanks for the fullness of my life – I’ve been doing that a lot lately. Then I affectionately patted my food baby, stood up and prepared for the short ride to the ferry terminal. After the day’s challenges, the ride was a breeze. We strolled onto the dock and peered into the night, expecting at any moment to see a ferry arriving. When several minutes went by with only the blinking of boats rocking in the harbor, Colin got the timetable out with the air of someone who anticipates a mistake. With an hour to kill (and unwilling to jump back on our bikes and go anywhere) we walked over to a bench that overlooked the harbor. We watched a few stars peek out while the lights from the car park behind us danced on the inky waves. Time inched by and we reflected on the day. Whether it was because the captain was less skilled or just because it was night, when the ferry finally arrived, it docked with considerable difficulty compared to earlier in the day. We boarded and eyed the salty deck where our bikes would hang with some suspicion. The cabin was a bit stuffy, but as there wasn’t an outside seat where we felt confident about staying dry, we settled in at the front. The ferry lunged forward, rolled a bit to the side, and then veered sharply to the right, as if barely avoiding an obstacle. Through the window, we could see the purple lights from Sky Tower and the CBD twinkling in the distance, then dipping and rolling in front of us. A drunk woman on the other side of the cabin braced herself as the ferry swayed and her wide, mascara-smeared eyes registered panic. As the lights on the horizon tilted like we were in a fun house, I couldn’t help but think about the ferry that sank of the coast of South Korea. The soda bottles in the concession stand fridge clinked as they fell over, but the cashier looked nonplussed. While the ferry bounced about on the waves, Colin and I discussed just how awful the weather would have to be for the trip to be cancelled. I felt vaguely relieved when we finally docked in the CBD and rolled our bikes back onto solid ground. We cruised home, busted it up one more giant hill, and as we turned the corner onto Ponsonby I felt a familiar sinking as my rear bike tire gave out for the second time that day. Unwilling to go through the effort of fixing another flat and in utter disbelief that our epic adventure wasn’t over yet, we continued on foot. At midnight, as we crawled into bed clean and warm and worn out, we could hear the first gentle plops of water against the window and then the static roar as rain blanketed the city. This is what relief looks like.